Halloumi is from Cyprus, or as this country is also known: “The Island of Aphrodite”, home to the ancient goddess of love and beauty after she emerged from the foam of the Mediterranean Sea. Halloumi, most typically produced from sheep’s milk or sheep and goat’s milk, has been made in Cyprus for hundreds of years. Traditionally Halloumi is seasoned with mint leaf pieces, which gives it a slightly herbal quality. Semi-hard and bouncy, Halloumi’s texture is likened to a firm mozzarella, but also has the briny moisture of feta that contributes to its slightly salty flavor. Halloumi is also called “the grilling cheese” for its high melting point that allows it to be fried or grilled to a lovely golden brown without melting or running. A Cypriot delicacy, Atalanta’s Halloumi is made with pasteurized sheep’s milk and contains no animal rennet, making it suitable for vegetarians. It is also Halal certified. Application: An important part of Cyprus Meze (traditional small dishes served at the start of large meals), Halloumi is usually sliced, pan-fried or grilled and served garnished with oil and herbs such as oregano and mint. It is also known as the flaming cheese in the dish, Saganaki. Delicious with meats and vegetables, Halloumi can be skewered for barbecuing, is great in salads and goes very well with watermelon, olives and capers. Pairing: Perfect with a dry rose or a lager style beer. An inviting medley of five, fine Mediterranean olive varieties: Nocellara of Belice, Calabrese, Nicoise, Kalamata and Nocellara of Etna. The olives are all-natural and are not pasteurized, keeping the flavor and quality of the olives intact. They are carefully pitted, seasoned with sunflower seed oil and spices, then packed in water and salt with no preservatives added. With each variety lending its distinctive taste, color, shape and texture to delicious, healthy and easy entertaining ideas, anyone will enjoy finding their favorites among the mix. 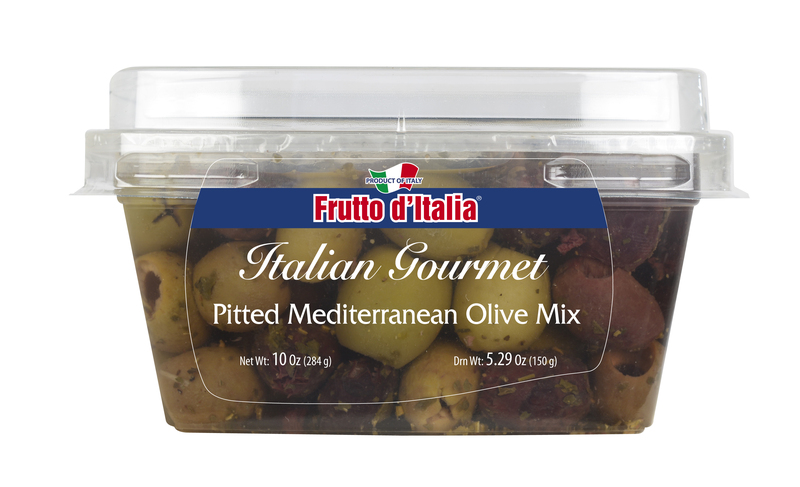 Frutto d’Italia Pitted Mediterranean Olives are great for anything from bar offerings, sides and salads to garnishes and ingredients in main dishes. They are also a great accompaniment to cheese.